The following article presents a viewpoint on crises and long-term trends of the capitalist economy that differs in important respects from the views of most Marxist economists today. This viewpoint has been developed over some 50 years of study, observation and political activism and is shared with the author of the blog “Critique of Crisis Theory,” Sam Williams, with whom I have collaborated since the mid-1970s. During the five-plus years of the blog’s existence, I have served as lead editor. Beginning in the late 1960s, Williams spent years in the New York Public Library studying the works of Marx and Engels on political economy, as well as Adam Smith, David Ricardo, John Maynard Keynes and other major writers and thinkers. In the course of this study, Williams developed a basic understanding of Marx’s theory of value, surplus value, money and price and applied that understanding to fleshing out Marx’s theory of capitalist crisis, which Marx never completed. My understanding of Marxist economic theory and its application to today’s monopoly capitalist economy took root as a result of the major crisis of 1973-1975 and discussions I began to have about it and subsequent economic developments with Sam Williams that have continued up to the present. It my sincere hope that the publication of this article on the Liberation School website will stimulate interest in Marxist economic theory, a constructive discussion of the important ideas raised, and a greater appreciation of the urgent need for a revived workers’ movement with a revolutionary perspective. Steep falls in the stock and primary commodity markets have wiped out trillions in asset values following the Federal Reserve’s credit tightening and first hike in interest rates since the Great Recession of 2007-2009. The dollar price of gold has risen sharply, as hedge funds and other big speculators dump dollars in favor of the yellow metal. Meanwhile, mass movements have arisen once again in the United States, Europe and elsewhere on both the left and right. Chaotic wrangling and political polarization mark the current presidential campaign in the U.S.
Could we be headed into a renewed general crisis of capitalism—that is, a systemic crisis marked by global political and economic instability that poses the issue of which modern class rules? To answer that question, we need to examine the role money played in the initial rise of capitalism and then its quite different role in the general crisis that first appeared with World War I and the Russian Revolution. As Marx recognized, the discoveries and exploitation of gold and silver based on the brutal enslavement of indigenous peoples in the “new world” played a key role in the early development of capitalism. This was so because the precious metals, transported by ship to Europe, served as money capital for investments in trade and production, greatly expanded the market for commodities of all kinds, and brought about a long-term rise in prices and accompanying relative capitalist prosperity. Instead of chronic overproduction of commodities in relation to the market such as we see now, there was a chronic underproduction, marking the “rosy” dawn of capitalism. Further massive boosts to capitalist development occurred with the discovery of large gold deposits in California in 1848-1849, in Australia beginning in 1851, subsequently in South Africa in 1886, and then in Alaska and the Canadian Yukon in the 1890s. A fundamental factor underlying the general crisis of capitalism that began in the early 20th century was the rise of monopoly capitalist/imperialist powers that divided up the world leading to two horrific world wars. Another key factor was that there were no more (1) major gold discoveries on the scale of those already mentioned, and (2) no more major technological advances in mining and refining gold comparable to the cyanide process developed in 1887 and first used in the 1890s. Chronic capitalist underproduction of commodities in relation to monetarily effective demand was transformed into chronic overproduction. The money commodity gold became in the pre-capitalist era of simple commodity production and exchange the universal measure of labor value and continues in that role today. Value is the quantity of socially necessary abstract human labor (without regard to the diverse concrete kinds of labor) embodied in commodities—defined by Marxists as products of human labor to be sold or exchanged on the market. According to the theory of labor value—first developed by the early political economists Adam Smith and David Ricardo and perfected by Marx—the relative prices of commodities (in terms of the money commodity) are based, on average, on the ratios of labor time required to produce them. That labor time (value) cannot be directly measured under capitalism; hence the need for a money commodity. History has shown that the existing global hoard of gold and its rate of increase ultimately governs, through the mechanisms of price, interest rates and monetarily effective demand, the growth of the global capitalist market. These must be taken into account in any analysis of the general crisis of capitalism. Since the early 20th century, rises in gold production sufficient to bring about long waves of rising commodity prices in gold terms (that is, real prices)—and therefore extended periods of relative capitalist prosperity—have only come about after a sequence of severe economic contractions. Such downturns occurred in 1920-1921 and 1929-1933, 1973-1975 and 1980-1983, and finally 2007-2009 and (possibly) 2016-20??. Each such sequence of economic slumps lowers prices of non-monetary commodities in gold terms, reducing costs of production to the point where gold mining/refining is profitable enough to set off a new extended rise in gold production and real prices of non-monetary commodities. As the existing richest gold deposits are exhausted, the labor value of gold rises (more labor is required to mine it), which pushes down prices of non-monetary commodities in terms of gold. That means that lower and lower prices (in gold terms, measured in ounces of gold) are required to bring about a substantial fall in costs of production and resulting sustained increases in gold production. The falling real prices, in turn, require periodic sharp devaluations of the dollar and other paper currencies to keep nominal prices (measured in paper currency units such as dollars) from falling or falling further. Such devaluations occurred in 1933-1934 under Franklin Roosevelt (after prices had already collapsed during the super-crisis of 1929-1933), in the 1970s after President Nixon took the dollar off what remained of the gold standard, and again in the 2000s up to late 2011. A principle now followed by all monetary authorities is to prevent at almost all costs a general fall in commodity prices in nominal, currency terms. 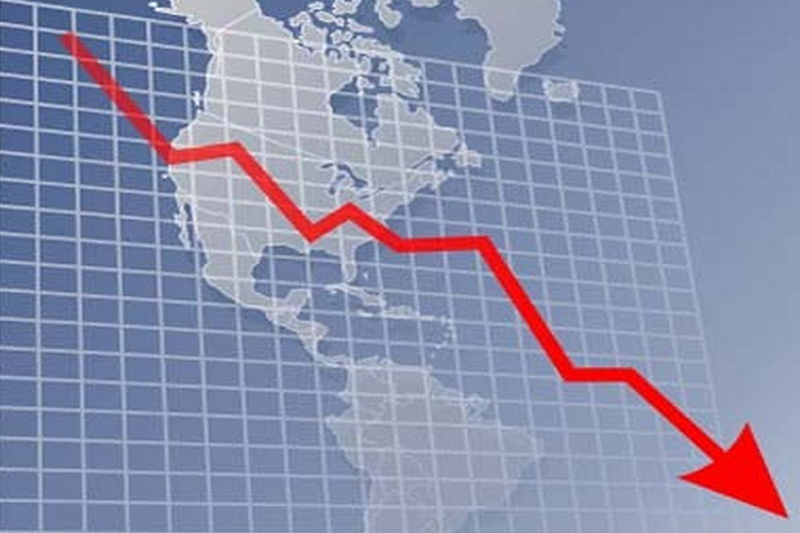 Thus, when deflation (falling real prices) strikes, as it inevitably does whenever the economy contracts, the only way it can be prevented in currency terms is through depreciation of the currency—for example, lowering the gold content of the dollar (causing the dollar price of gold to rise on the metals market). Owing to the lack of massive new gold discoveries and/or major technological advances in gold mining/refining, the long-term trend of real prices has been downward since the peak of 1920. The 1970 peak was substantially lower than the one in 1920, and the peak in 2001 was lower still. This trend is due mainly, as previously explained, to the rising labor value embodied in each ounce of gold mined and refined. The result is that it takes less and less of a rise in real prices to raise the costs of production sufficiently to make gold production/refining unprofitable and therefore to reverse an uptrend in gold production. The following three charts illustrate, respectively, rising and falling producer prices in gold terms, global gold production since the early 20th century, and China’s gold production since the 1949 revolution. The rise in gold production to a new record that began in 2009 at the low point of the Great Recession and continued to 2015 was partly due to a sharp rise in China’s gold production. As shown by the third chart below, China’s production continued rising right through the global downturn in production, shown in the second chart, that began in 2000. 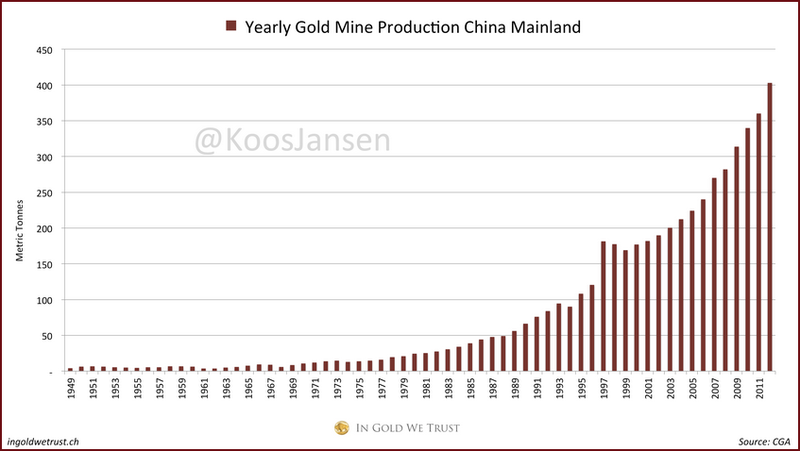 This is probably explained by China’s gold miners (which include large Canadian and Australian companies and many small domestic producers) making up for the very low production of the Mao years. China is now by far the biggest gold producer in the world. This unprecedented divergence between market prices (in gold terms) and labor values had to be “corrected” sooner or later. Otherwise, production of the money commodity gold would have become completely unprofitable and come to an end. That would bring capitalism to an end, since capitalism needs a money commodity to function—that is for Adam Smith’s “invisible hand” of the market to regulate production and distribution of commodities. That correction came with the force of a hurricane with the stock market crash of 1929 and subsequent super-crisis. The plunge in prices during the super-crisis resulted in a big increase in the profitability of gold mining/refining and consequently set off a sustained increase in gold production. 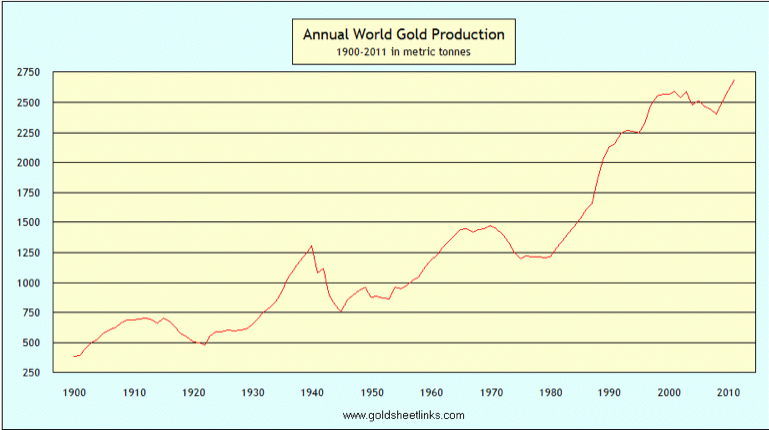 (See gold production chart above.) Interrupted by WWII, gold production resumed its rise through the following decades until the early 1970s. 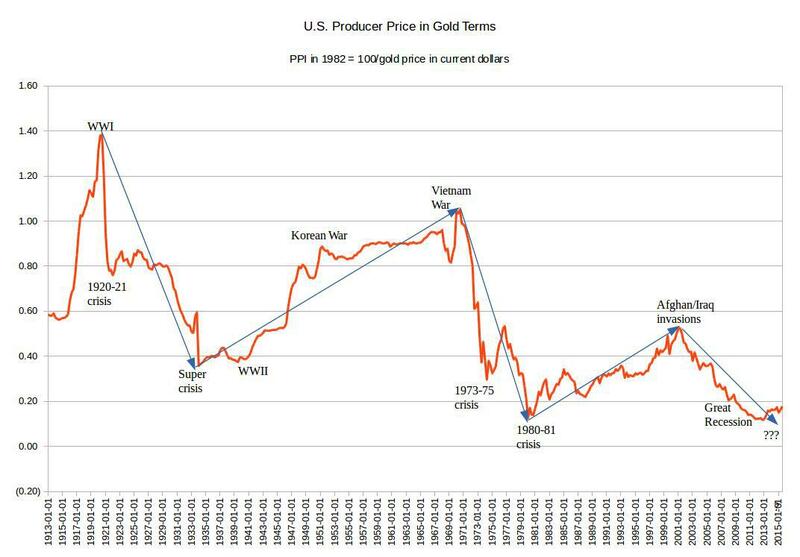 This rise in gold production, along with the accumulation of massive amounts of idle money during the Great Depression, kept interest rates low and enabled first the financing of the U.S. role in WWII and then a sustained expansion of the market and rise in real prices—the Long Boom of the post-WWII years. Once again, though, the boom itself combined with the stimulus of the Vietnam War and Lyndon Johnson’s “Great Society” programs in response to uprisings in the African American ghettos drove prices to unsustainable heights, causing the profitability of gold mining/refining to plunge and gold production to once again go into a sustained downturn, lasting until the early 1980s. If gold production peaked in 2015, as Goldman Sachs and others have suggested based on new gold discoveries peaking in 1995 (with about 20 years needed to fully exploit), another major economic downturn may well be necessary to set off a new sustained rise in gold production and expansion of the market—even one as modest as the Great Moderation. On the other hand, if gold production resumes its rise, it will be only a matter of time before real prices reach a level that once again makes gold mining unprofitable, reversing the uptrend and ushering in another major crisis of overproduction. In addition to the Russian Revolution and its immediate aftermath, two additional periods of major instability of class relations resulting in mass radicalizations occurred in the 1930s and 1960s-1970s. An incipient third mass radicalization may have begun with the new anti-war movement in response to the Iraq war, then the Occupation movement and most recently the Black Lives Matter movement. In Europe, the anti-austerity movement is taking center stage. In South Africa, mass movements against neo-liberal policies, widespread corruption and rising student fees have arisen. Kontratiev noticed that wars and revolutions tend to occur around the peaks and troughs of the long cycle. But he never came up with a convincing explanation for why that is. With the benefit of historical experience, an understanding of the Marxist theory of money and price, and hindsight, it seems likely that wars that occur toward the end of a rising phase of the long cycle, when overproduction has already begun, drive market prices to new peaks above underlying labor values that they otherwise would not reach. Then, when the war ends (or winds down), a violent reversal occurs requiring multiple major economic downturns to “correct” the previous rise in prices of non-monetary commodities and costs of production in gold mining/refining. When these costs fall sufficiently, gold production can rise again—and the market expand—on a sustained basis. As always, imperialist wars upset class relations and, following the initial patriotic fervor stirred up by the ruling class, generate social unrest and political radicalization. Examples of such “peak wars” are WWI, the Vietnam War, and the attacks on and occupations of Afghanistan and Iraq in 2001-2003. On the other hand, during troughs of the long cycle, economic activity is at a low ebb, large amounts of money lie idle, there is mass unemployment and unused industrial capacity, and interest rates are low. Under these circumstances, competition between imperialist powers and monopoly corporations reaches acute levels. Preparations for WWII began during the 1930s Great Depression. The super-crisis that kicked off the Great Depression upset class relations and produced vast hoards of idle money, mass unemployment, social unrest and a major radicalization along with political polarization that gave rise to mass fascist movements based on an impoverished middle class. While the aftermath of WWII was re-stabilization of class relations and a lengthy period of relative capitalist prosperity in the imperialist countries, the war greatly destabilized the old colonial empires (British, French, Dutch, and Portuguese) as the U.S. empire, using neo-colonialism, attempted to take their place and set off a huge wave of national liberation struggles and democratic—plus several socialist—revolutions that continued through the 1970s. This great revolutionary wave then helped to set off a new mass radicalization in the imperialist countries, especially the U.S., where the Civil Rights/Black liberation movement arose, together with a mass anti-war movement and women’s and LGBTQ struggles for equality. These combined mass movements for liberation initially reinforced each other but, lacking support from the reformist-led labor movement, which had grown complacent as a result of substantial gains made in the course of the Long Boom, gave way to a long period of reaction and counter-revolution at the beginning of the 1980s—culminating some 10 years later in the overthrow of the Soviet Union and collapse of the “socialist camp” with its reactionary aftermath worldwide that continues to impact us. While it appeared for a time that a renewed general crisis of capitalism was underway in the 1960s-1970s, subsequent developments showed that the capitalist ruling class was able to pull a rabbit out of the hat to get out of the crisis before its continued rule was seriously threatened. The Reagan-Thatcher counter-revolution and neo-liberal policies were launched, with the organized workers’ movement in the cross-hairs. These policies included the export of production and jobs on a massive scale to low-wage countries, big tax cuts for corporations and the wealthy (so that a greater portion of capitalist profit could go into dividends and boosting stock prices and top executive compensation), and a drive to either eliminate or privatize public services to the maximum extent possible. The net result was a huge boost to capitalist profits and greatly expanded opportunities for capitalist profit-making. The counter-revolutions in the Soviet Union and East Europe opened up vast areas to capitalist exploitation. The “opening up” of China to investment also greatly expanded opportunities for imperialist super-exploitation and profit-making. A fundamental aim of the neo-liberal policies was to weaken the labor movement and roll back social gains the labor and progressive movements had achieved (or were still achieving) in the areas of workers’, women’s, African-American, and LGBTQ rights. Coupled with cutting taxes on the wealthy and their corporations, the long-term tendency of the capitalist rate of profit to fall was for an extended period counteracted while inequality soared. Meanwhile, credit exploded as workers and members of the middle class went into debt to an unprecedented extent using credit card and home equity loans to maintain living standards, while increasing numbers of women joined the work force partially for the same reason. 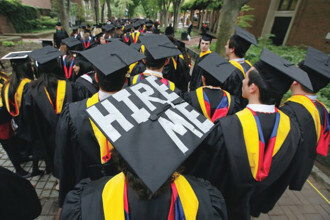 Students went deeply into debt as college tuition and fees rose sharply. The result was an explosion of debt across the board, even while home ownership (on paper) increased and a sizable section of the middle class prospered (at least on paper). This was the period of the Great Moderation, which ended with the Great Recession of 2007-2009. 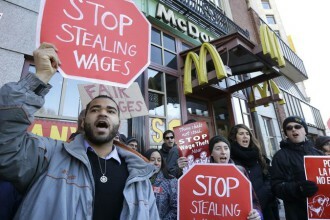 Now, it appears, the boost to capitalism provided by neo-liberal policies has run its course. Capitalist politicians who advocate continuing and even deepening the policies are increasingly discredited. The next economic contraction in the U.S. may not take the usual form of a crisis of overproduction preceded by a surge in interest rates and the general price level. If recent deflationary trends such as we have seen with the plunging price of oil and other primary commodities deepen and spread, the next downturn could take the form of a “deflationary recession,” brought about by the decision of the Federal Reserve Board in 2014 to end quantitative easing by maintaining the monetary base at roughly the current level (no further expansion of bank reserves for the time being) and, most recently, raising its policy interest rates. The steep “Roosevelt recession” of 1937-1938 was also a deflationary recession, induced by Federal Reserve tightening measures. A new crisis of overproduction taking the usual form—that is, preceded by an inflationary surge—could occur if the Federal Reserve were to reverse course and bring about a new devaluation of the dollar, perhaps as a result of additional quantitative easing. The recent sharp rise in the dollar price of gold if it continues would produce such an outcome. That price has risen from $1,050 an ounce late last year to as high as $1,264 as of this writing, representing a 17 percent decline in the dollar’s gold value in just a few weeks. This fall in value is probably due to hedge funds and other big speculators anticipating such a policy shift on the part of the Fed. This would be a highly dangerous path for the Federal Reserve to take, however, because it would risk a huge run on the dollar. A collapse of the dollar, the main world reserve currency, with all the advantages that provides for financing U.S. deficits and the huge military spending required for defense of the U.S. empire, would mean an end to the empire, and can be expected to be avoided at almost any cost. The next few months and years promise to be a watershed period for the world economy, and a new overproduction crisis cannot be staved off for long. How deep the next contraction will be remains to be seen and is impossible to predict, though a new super-crisis on the scale of the early 1930s or greater is not out of the question, especially if gold production did indeed peak in 2015 and is now in decline. The likely result of such a crisis will be further mass radicalization on a world scale, but also a heightened threat of fascism and more war, possibly even a world war that could wipe out the human species altogether. Deep-going economic crises produce mass radicalization but also class polarization because the working class is affected differently than the middle class. Members of the working class proper suffer mainly from unemployment in a crisis, which takes away the market for the one commodity we own and have to sell—our ability to work, our labor power. Many of us also lose our homes, cars and other personal property. At the same time, however, especially in times of crisis, members of the middle class feel themselves to be oppressed by the giant banks and monopoly corporations and become enraged when they lose their livelihoods and property. If a strong working-class movement arises to show the way out of the crisis (socialist revolution), sections of the middle class can become allies in the struggle. Even if massively organized, however, a reformist-led workers’ movement by its very nature cannot take power and begin the construction of socialism. Neither can a workers’ movement split down the middle between reformists and revolutionaries, as was the case with the German workers’ movement in the 1920s and early 1930s. In either case, sizable numbers of the radicalized middle class, especially the youth, can turn against the workers as well as against Muslims, African Americans and/or immigrants, who are blamed for the crisis, and be mobilized in combat formations to destroy all organizations of the working class, both reformist and revolutionary. Such is the inevitable aim of a rising fascist movement based on racist demagoguery and scapegoating. History shows that the capitalist rulers may when in deep crisis even allow such movements to take power, resulting in a new period of barbarism such as we saw with the fascists—far from limited to the Nazi movement in Germany—in the period leading up to and culminating in WWII. Alternatively, the military may stage a coup, also sweeping aside bourgeois democracy and repressing working-class and progressive organizations. We are not there yet, but if a renewed general crisis of capitalism has begun, the threat is real. Only a strongly organized, united working-class movement led by a mass revolutionary party can head off such a disastrous outcome. It should also be acknowledged that many, maybe most, Marxist economists do not accept that gold continues to play the role of money commodity and universal measure of value. Rather, they believe, falsely in my opinion, that since the end of the gold standard, gold is now “just another commodity,” and paper (token) money simply reflects the value of all commodities being produced.